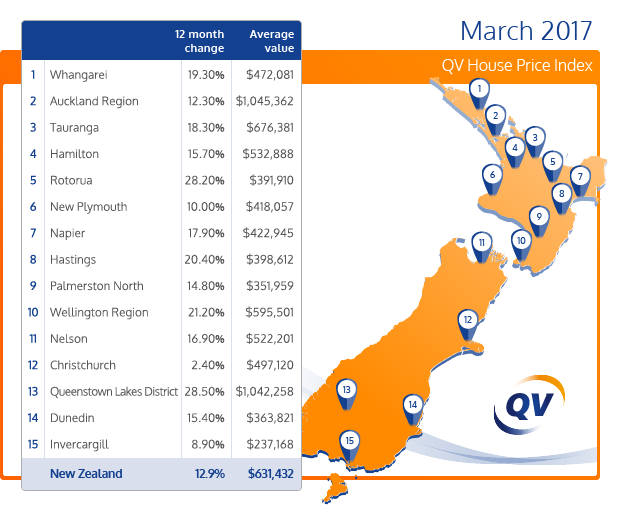 The latest monthly QV House Price Index shows that nationwide residential property values for March increased 12.9% over the past year. Values rose by 0.6% over the past three months and the average value nationwide is $631,432. The nationwide average value is now 52.4% above the previous market peak of late 2007. When adjusted for inflation the nationwide annual increase drops slightly to 11.4% and values are now 28.5% above the 2007 peak. Residential property values across the Auckland region increased 12.3% year on year and quarterly growth has decreased by 0.2% over the past three months. The average value for the Auckland Region is now $1,045,362 and values are now on average 91.3% higher than the previous peak of 2007. When adjusted for inflation values rose 10.8% over the past year and are 61.2% above the 2007 peak. The full set of QV House Price Index statistics for all New Zealand for March can be downloaded by clicking this link: QV House Price Index (HPI) for March 2017. While the overall figure for the Auckland region has decreased slightly by 0.2% over the past three months, home values in some areas have now stabilised and are continuing to rise in some areas of Auckland. The former Auckland City Council central suburbs rose 12.5% over the past year and 0.9% over the past three months and values are now 97.5% above the previous peak of 2007. The average value in the central suburbs is now $1,229,715. Waitakere City values rose by 12.1% year on year but decreased slightly by 1.4% over the past three months. They are now 95.5% above the previous peak of 2007. Values in the former Manukau city area rose 12.6% year on year but decreased slightly by 0.5% over the past quarter. The average value in the southern suburbs is now $900,324. Values in the former North Shore City suburbs also rose 11.5% year on year but decreased 1.4% over the past three months. The average value across the bridge is now $1,201,367. Rodney values continue to rise up 13.3% year on year and 1.2% over the past three months and the average value is $940,701. Franklin is also up 13.1% year on year and 1.1% over the past quarter. Papakura values also increased 12.6% year on year and 1.2% over the past three months. The downward trend seen in Hamilton home values seen since the introduction of the latest round of lending restrictions has continued in some parts of the city but other areas are now seeing values stabilising and rising again. Overall values for Hamilton city have risen 15.7% year on year and they have decreased slightly by 0.4% over the past three months and they are 47.4% higher than the previous peak of 2007. The average value in the Hamilton is now $532,888. The Tauranga market continues to rise but at a much slower rate than prior to the LVR restrictions introduced late last year. Home values in Tauranga City up by 18.3% year on year and 0.6% over the past three months. The average value in the city is now $676,381. Meanwhile, the Western Bay of Plenty values continue to rise more quickly, up 18.7% year on year and 3.3% over the past three months. The average value in the district is now $590,608. The QV House Price Index for the wider Wellington region continues to rise with home values up 21.2% year on year and 3.7% over the past three months and values are now 30.7% higher than in the previous peak of 2007. The average value across the wider region there is now $595,501. Wellington City values are up 20.8% year on year and 3.3% over the past three months and the average value there is now $716,613. Porirua values are up the most over the past three months rising a massive 7.1% since January and 25.4% year on year. The average value there is now $511,483. Meanwhile, Upper Hutt values are still accelerating up 26.6% year on year and 4.7% over the past three months. Lower Hutt values are also still rising rapidly up 25.6% year on year and 5.4% since January. “First home buyers remain active in the market at record high levels. Investors are also active however some are struggling to secure finance since the introduction of LVR restrictions last year." Home values in Christchurch City are rising again in all areas across the city apart from Banks Peninsula after seeing a downward trend following the LVR coming in late last year. Values increased 2.4% year on year, 0.6% over the past three months and they are now 31.0% higher than the previous peak of 2007. The average value in the city is now $497,120. The Dunedin market continues to be buoyant with city home values rising 15.4% year on year and a 2.7% over the past three months and values are now 27.1% above the previous peak of 2007. Dunedin remains the most affordable main centre in New Zealand with an average value of $363,821. Dunedin-Coastal saw the highest growth over the past quarter with values there rising 19.6% in the year to March and a huge 9.5% over the past three months. Nelson home values continue to see strong value growth up 16.9% year on year and 4.5% over the past three months. The average value in the city is now $522,201. Values continue to rise in the Tasman District up 16.3% year on year and 2.7% over the past three months. The average value in the district is now $512,754. Napier values are up 17.9 % year on year and 1.9% over the past three months. The average value in the city is now $422,945 and values are now 24.3% above the previous peak of 2007. The Hastings market continues to see strong value growth up 20.4% year on year and 3.0% over the past three months and the market is now 27.9% higher than 2007. The average value there is now $398,612. In the North Island, all areas saw values rise over the past year. Areas just south of Auckland continue to see strong growth with South Waikato District values up 35.7% year on year, and strong value growth continuing in the Hauraki, Waikato, Matamata Piako andThames/Coromandel districts. Rotorua also continued to see strong growth with values up 28.2% since March 2016 and 4.5% over the past three months. Values are rising in Whakatane, Opotiki, Gisborne, Rangitikei, Whanganui, Palmerston North and the Horowhenua after many years of relatively low value growth. The only areas to see values decrease over the past quarter were some parts of Auckland and Hamilton, Wellington-West, Stratford, Waitomo and the Kawerau District where recent massive percentage value growth appears to have peaked. In the South Island, most areas saw values rise over the past year with the exception of the Grey District on the West Coast. The MacKenzie District once again saw the highest annual value growth up 30.6% year on year and 9.5% over the past three months. While Central Otago District was also up 22.8% year on year and a huge 10.0% over the past three months. While values decreased in the Hurunui, Ashburton, Waimate, Grey and Buller districts over the past three months.